THE first two-thirds of “The Roots of Heaven,” which opened at the Palace last night with a benefit première for The Lighthouse, looks like a highly potential adventure film. An odd situation as been uncovered in French Equatorial Africa, some interesting characters have been assembled and some delicate lines have been drawn. A grim Trevor Howard has been presented as a zealot with the annoying idea that men should do something insistent to stop the hunting and killing of elephants. These large beasts are the symbols of freedom and dignity in a world that’s too full of nonsensical killing, he has vainly preached at the pub. And then, with the authorities yapping at him, he has gone off into the hills with a tiny band of disciples to try to rally a full-scale crusade. In his band are a couple of weird-beards from the far intellectual fringe and a violent pan-African organizer, whom Edric Connor plays. (The latter is against killing elephants only because he hopes to gain support for his political organization; he treacherously defects toward the end.) The band is later joined by Juliette Greco as a hotel “hostess” with a past and by a rapidly disintegrating boozer, blowzily played by Errol Flynn. With a handful of natives toting rifles, these people have come down out of the hills, spanked a boastful female big-game hunter and spread leaflets proclaiming their aims. They are ready to defy the ivory-poachers when an intermission is announced on the Palace screen. After the intermission, the final third of the film goes down the drain. This is the more disappointing—and strangely surprising, indeed—because the elements, up to this point, have seemed so beautifully under control. 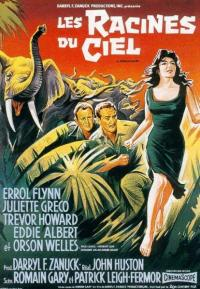 While the screen play by Romain Gary and Patrick Leigh-Fermor, based on M. Gary’s book, could be firmer and less elaborate and garrulous in spots, it is studded with sharp dramatic incidents that accumulate and play extremely well, Under John Huston’s fine direction, the action moves along in splendid style. More conspicuous is the rich production that Darryl F. Zanuck has arranged. There is an embarrassment of riches, as far as pictorial features are concerned. Most of the vivid outdoor action has been shot in Africa, in Cinema-Scope and color that catch the heat of the sun. And the cast is so large that Paul Lukas, Olivier Hussenot and Orson Welles—the last as an American television broadcaster—can be beautifully squandered in small roles. Everything seems to be in order, until that final third. Then the screen play just goes to pieces. The ivory-poachers do appear to raid a mammoth herd of lumbering elephants that the zealots are watching with glistening eyes. A battle takes place, the poachers win out and charitably let the zealots go free. And what do they do? They stumble off into the wilderness to an ending that is utterly vague. Maybe some sort of allegory was intended to run through this film. Maybe the elephant lover was meant to be a modern Messiah, followed by feeble disciples and a Mary Magdalene. If so, the symbols are flimsy and the ideas are never firmed. There is no real dramatic implication, except that the elephant’s jig is up. And the performances, which are forceful in the first two-thirds of the film, run progressively to twaddle as the survivors stagger toward the end. Mr. Howard appears to go crazy, Miss Greco slips into a drab decline and Mr. Connor, who has the one role with beef in it, is saved when he takes it on the lam. Eddie Albert comes in late as a news photographer when things are going to pot. He adapts quickly to disintegration. “The Roots of Heaven” does not go deep in sandy soil. THE ROOTS OF HEAVEN, screen play by Romain Gary and Patrick Leigh-Fermor; based on the novel by M. Gary; directed by John Huston; produced by Darryl F. Zanuck; distributed by Twentieth Century-Fox. At the Palace, Broadway and Forty-seventh Street. Running time: 131 minutes. This entry was posted in The Roots of Heaven and tagged Patrick Leigh Fermor, The Roots of Heaven on November 5, 2010 by proverbs6to10. I’ve just discovered this blog and, as a fan of Patrick Leigh Fermor’s writing, am enjoying it immensely. But here’s a question: how does one properly write the author’s name? I notice on the movie poster he is listed as “Patrick Leigh-Fermor,” with a hyphen; whereas, on his book jackets, he is “Patrick Leigh Fermor”– hyphen-less. This presents a problem for indexers. Should he be listed as “Leigh Fermor, Patrick” or “Fermor, Patrick Leigh.” I notice that his father is Sir Lewis Leigh Fermor.” Is “Leigh Fermor” (or “Leigh-Fermor”) the family name, or is it simply “Fermor”? Any ideas? Ken – it is hyphen-less. Simple as that. I could say that the poster was produced by Americans … but let’s not go down that route! Glad you like the blog. There are nearly 100 postings I believe so it should keep you busy for a while. You are always welcome to make a contribution.